Ongoing Airstream Travels: The Truck has been found! The Truck has been found! Found the truck I was looking for... or at least someone did. It was a lucky happenstance that the new local Airstream dealer was a offshoot of a large Ford dealer. After he wouldn't give me a good deal on an Airstream I offered him a chance to find me a F150 with the Max Tow Package. There wasn't a single one of these anywhere in MA. He got back to me in a couple days with 2 choices, one of which was was a good fit. It was a couple hundred miles away but it would only take a few days to get here. We agreed on a good price, I am not sure if it was just that trucks aren't selling so great with almost 4$ gas or that he knew I didn't want to dicker around on price after losing the chance to sell me a trailer to another dealer who gave me a better price. 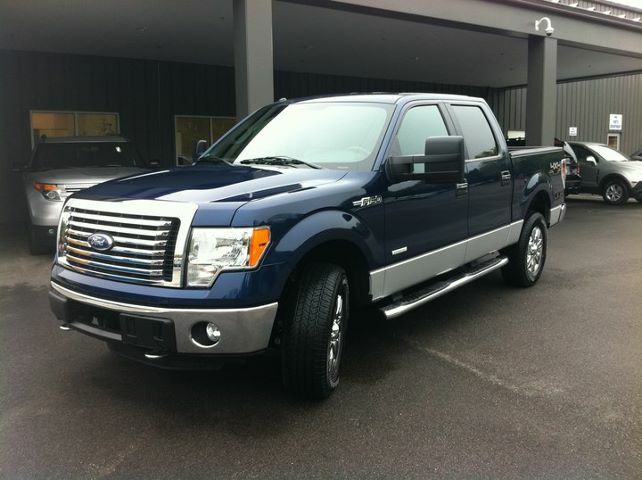 Either way I was happy with the price and the truck which is a 2011 F-150 Super Crew Cab with Max Tow Package. It is Ford Blue with a Silver accent.